Welcome to another 52,000 vehicles! By the end of 2009 there were 52,000 more vehicles on GB roads than at the end of 2008 and this is despite a big down-turn in car sales, and government money in a scrappage scheme to encourage sales until the end of March 2010. The scrappage scheme did at least take one old car of the road for each qualifying new car. Between 1997 and the end of 2009 (roughly the period Labour’s term of office) the number of cars on GB roads increased by over 7 million or 27%! Clearly the purchasers of these additional vehicles plan to leave them somewhere when they are not in use. 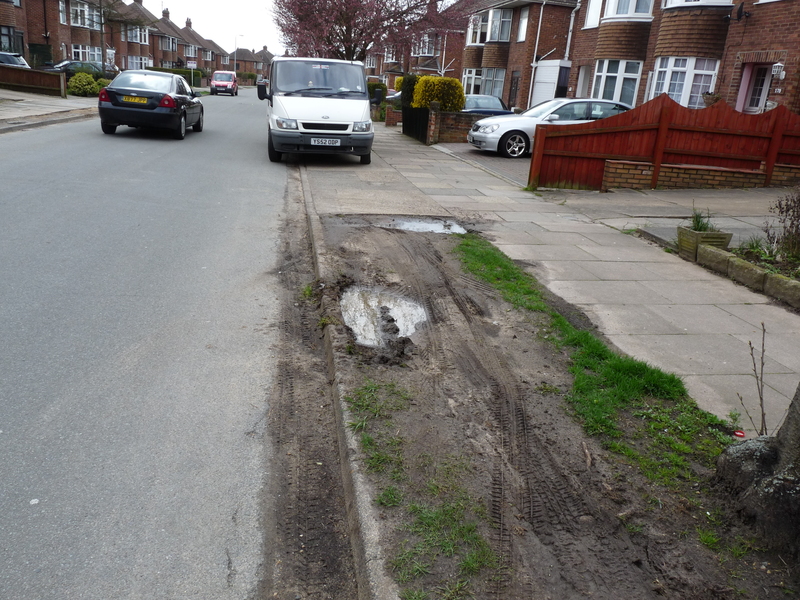 This may be outside some new house on a shiny new driveway or somewhere else out of the way however I am sure many front gardens were dug up with associated dropped kerbs, creating their own problems for pedestrians. Many will of course have been squeezed onto the highway where-ever possible, across pavements, on verges etc etc. 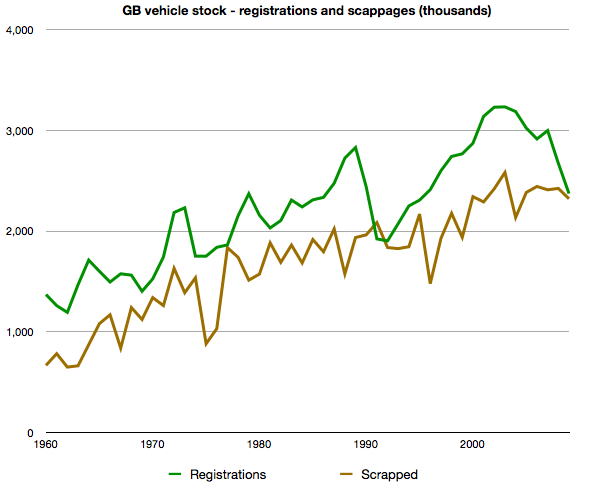 Here is a graph showing the relentless increase in vehicle numbers in Great Britain since 1950. 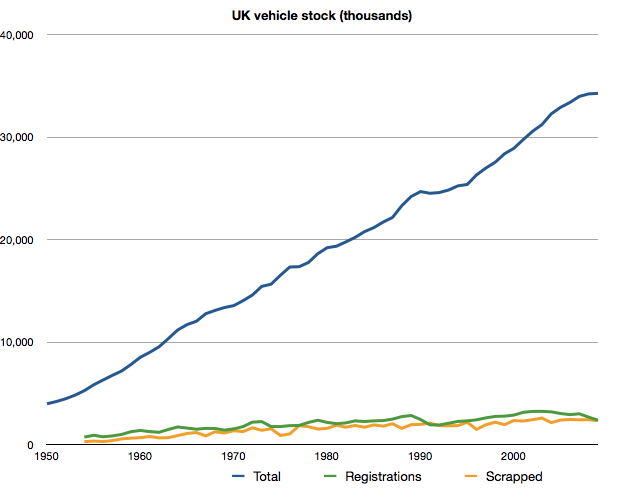 And here is the graph showing just the registrations and scrappages each year for 1960 onwards. The bumps and lumps in the curve generally fit with the state of the economy. The lack of sales and relatively low increase in the vehicle stock is in general treated as a problem by government because of the lack of ‘growth’ which is in their view always a good thing. In human beings uncontrolled growth is known to a huge problem (we call it cancer!) and if the pet hamster we had as a kid hadn’t stopped growing at the right moment then results would have been disastrous as pointing out in this wonderful little animation. There are however also encouraging signs that we may be approaching a peak in vehicle numbers and that they could drop significantly in the coming years. Car clubs are growing fast, cycling is growing fast, rail travel is growing fast and mileage in cars per head of population has actually been on its way down for some time now. In addition the iPhone, blackberry and other smart phones can only be used when someone else is driving. Personally I think it is the mobile communications devices that will encourage most people out of their cars so that they can work while traveling. That is the subject for one of more later post though! motorists – 2nd class citizens?! Mr Herron from Sunderland has spent more than £100,000 of his own money campaigning to improve the status of motorists who he said had been treated as “second-class citizens” but didn’t convince the judge I am pleased to say. He lost a court case where he claimed that the controlled parking zone in Sunderland city centre were too large and confusing for drivers and wanted the 39 penalty charge notices issued against him for parking on single yellow lines within the zone to be ruled unenforceable! 39 times? The markings must be very confusing or is this another case of willful ignorance? He also complained about “petty little bureaucrats”, “stealth taxes” and said he only wanted “fair enforcement” etc etc. He said that prohibitions in a controlled parking zone should only be enforced if every part of every road within the zone had been marked with either parking places, a single or double yellow lines. Commenting on the Heron case, Paul Watters, head of transport policy at the AA said: “There is a need for greater clarity in the implementation of parking restrictions by councils across the country”. Paul Watters also recently suggested that every single dropped kerb should be marked with white paint to warn motorists not to park across them! For course the AA recently complained that fines for illegal parking should only cover the associated enforcement costs. Are the AA suggesting that fines should be massively increased to cover the cost of marking every dropped kerb and controlled parking zone in the country or is he expecting that cost to be also share out between motorists who already know the law and by non-motorists! I think I know the answer already. Talking about democracy and fairness. I recently posted about how 88% of the ‘traffic’, ie the pedestrians, dropping kids of at a local primary school where on foot but only got 18% of the highway to use. Now that is 2nd class in by my recogning. 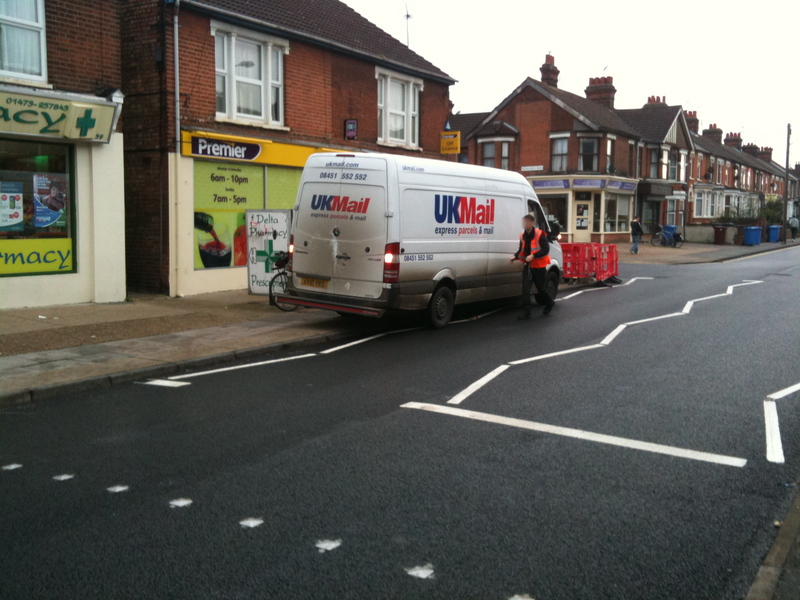 I passed a UK Mail delivery van parked on the zig-zag lines by a pedestrian crossing yesterday. I asked him politely to move and he responded saying he was allowed to stay there for 5 minutes. wrong! When I challenged him I got a tirade of abuse including words beginning with F and P together with the ‘get a real job’ and ‘people like you need a smack in the gob’ etc. Not exactly what on expects from postman pat! Update… see bottom of post for an impressive, prompt and helpful response from UK Mail to this particular incident. It is, of course, a criminal offense to even stop on the zig-zag lines. To quote: “The only time in which it could be permitted to stop on zigzag lines is in the case of an emergency or where the reason that the vehicle came to a halt was beyond the driver’s control”. Rule 240 of the highway code says You MUST NOT stop or park on …”a pedestrian crossing, including the area marked by the zig-zag lines”. The actual legislation is in ‘The Zebra, Pelican and Puffin Pedestrian Crossings Regulations and General Directions 1997’ (Section 18). The markings are defined in schedule 4. I notice that their website implies that these drivers are self employed and that the job is ‘fast-paced, exciting, challenging – and lucrative.’ ‘An average day will see me make in excess of 100 deliveries and 20 plus collections.’ and ‘it requires energy, adrenaline and vitality in bundles.’ They do also say that ‘UK Mail invests a lot of time and effort in training and supporting its staff’ however that doesn’t seem to include training about the Highway Code. It is a public company which operates 3,500 vehicle from 50 sites and made £17m profit last year. It says that it is committed to pushing the boundaries of the postal and express delivery markets. Ummm, does that include parking? The choice of these huge vehicles is of course a business decision as is the number of deliveries required in a day as is the decision to incentivise the drivers and celebrate speed on their website. The drivers lack of knowledge of the law seems to fall into the category of ‘willful ignorance‘ which is a very common condition amongst poor parkers! Of course if the drivers are really expected to do 120 deliveries/collections in a day (lets assume a long 10 hours) then that is one every 5 minutes which doesn’t give much time to find a parking spot each time in such a large vehicle when they also have traffic to deal with and finding the person to sign for the package. This is the third time in a few weeks that we have experienced an aggressive response to poor parking choices by people driving professional vehicles who have all said that they are parking legally. Personally I feel it is an issue we will see time and time again until these companies feel financial and brand pain. As usual I will contact the company and see what they say. Within 1 hour of emailing the head office I have received both an email and a phone call from the local UK Mail manager and he is taking it seriously. Very impressive! To quote from his email (with him permisssion). I hope that the driver will also be taking this important message on board. maintain very high standards in both performance and customer service. your feedback this will allow me to do so. anything that would be deemed as unacceptable again. We are not above the law and however “pressurised” it appears my people are I do not accept such actions. A colleague commented yesterday that ‘we all have bad parking days’. 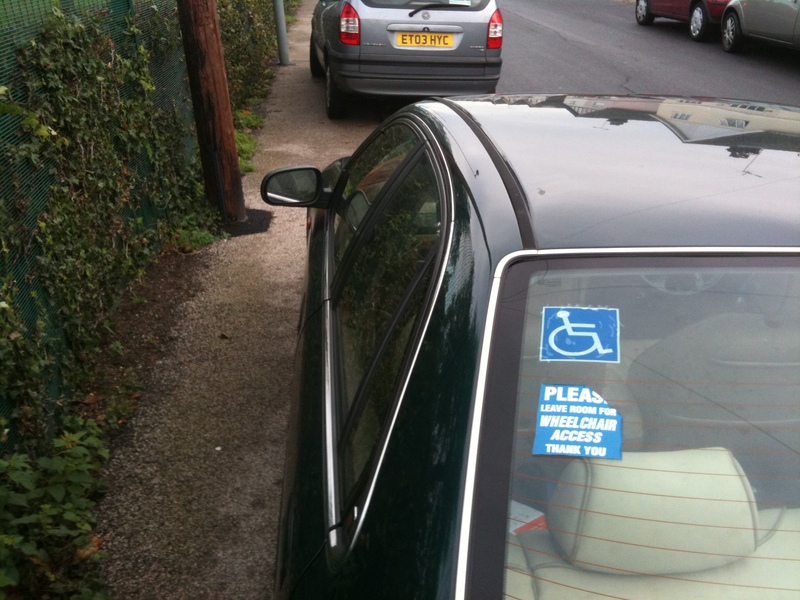 This person certainly was having one given that he was blocking the pavement with a car sporting a sticker saying ‘please leave room for wheelchair access’! Please leave room for a wheelchair! Some fake yellow lines turned up over night at a dangerous junction in Elmswell in Suffolk some time ago when a concerned resident took it upon themselves to tackle a parking problem. The parish clerk said: “The lines appeared on a corner which is incredibly busy and narrow where there had been some rather thoughtless parking”. The markings only came to light around six weeks ago when the parish council applied to create a disabled parking bay on the same side of the street. The parish council want them to stay, the county council say that they are illegal and go. The legal process to create real ones costs £1,500 and there isn’t any money. Possibly we need a simpler process? Of course there are plenty of regulations about not parking where the vehicle may cause a nuisance or obstruction but the motoring lobby is basically too strong at present for the authorities to dare use them. That is why we need to build a stronger and more vocal ‘pedestrian lobby’. Incidentally the UK seem to also be pretty keen on fake speed cameras created by local people. A retired policeman in Newbottle, near Houghton-le-Spring, Durham recently installed a fine bird-box in his garden that displayed remarkable similarities to a Gatso speed camera. A device also appeared in Congleton, Cheshire. Indeed their are a veritable rash of these devices across the country. The last month an enterprising resident of Cardiff decorated an ex-police van to look just like a mobile speed detection van and left it in his street. The good thing is that these interventions do seem slow the traffic down. It is not illegal to install such devices on your own property and the van was legal because it didn’t say anywhere on it that it was a police vehicle. In some ways the rules that came in in 2001 saying that cameras have to be yellow and visible from a distance can be used to advantage. Again the process of getting real cameras seems very complicated, however at least the macabre rule that only allowed cameras to be installed at locations where 3 people had died or been seriously injured in the last 3 years was removed in 2007. Imagine being told that a village had to wait for another death to get the camera they needed. A farmer in the USA went as far as to install his own lower speed limit signs for the road and even had the local troopers issuing tickets on the strength of them.